You know that clicky gold pen the world and its cat have been raving about for the past 20 years? The one that’s sold somewhere in the world every 10 seconds? The one that’s supposed to cure all complexion woes, from whisking away dark under-eye circles to making cheekbones pop? The one that actually only seems to make those circles look even more prominent and turns your complexion lifeless? The golden tube that’s languishing somewhere at the back of your dressing table, since you can’t figure out what exactly this wonder product does? Meet the YSL Touche Éclat: one of those beauty products with whom I’ve had a love-hate relationship since forever. I first tried it in college to erase signs of fatigue from under my eyes and ended up drawing every single person’s attention to them. Not surprisingly, I never went back. That is until every single makeup artist backstage at fashion shows, photo shoots and on movie sets, started mentioning it as a ‘Top 10’ staple in their kits. Could I actually have been wrong? Did the YSL Touché Eclat actually work as advertised? Is it really the only thing you need in a makeup bag? Yes, yes and yes. My biggest mistake (and that of zillions of other women, much to my relief) was in thinking of Touche Éclat as a concealer. It is NOT a concealer. Yes, repeat after me: the YSL Touche Éclat is NOT a concealer. Actually, it’s not even a highlighter. In fact, when Terry de Gunzberg created it in 1991, she actually gave birth to a whole new category of make up that’s now a staple in the lineup for almost every beauty brand. But YSL’s version is still the best and it works in so many ways… almost every make up pro that I meet tells me a brand new way of using this golden pen. Here’s a compilation of the top tips. Enjoy! 1. Banish under-eye circles: First, apply your regular concealer because – remember – YSL Touche Éclat is NOT a concealer. Then paint Touche Éclat in a a semi-circle around the eyes, starting from just above the inner corner, going down to where the eye area meets the cheekbone and moving back up to the outer corner; blend upwards. This will reflect light and illuminate the under-eye zone. 2. Perk up your eyes: A dab in the inner corner of the eyes will make them look wider and brighter, while concealing signs of fatigue. 3. Lift the brows: Blend a thin line below and over your brows to sharpen their definition and lift the entire eye area. 4. As an eyeshadow base: Use Touche Éclat all over the eye lid as a make up base or primer to improve the hold of eye shadow and help prevent any creasing. 5. Slim the nose: Draw a vertical stripe of YSL Touche Éclat down the bridge of your nose to make it appear slimmer and more chiseled. 6. Banish the red: Apply on the corners of the nose to neutralise redness and broken veins. 7. Hide wrinkles and fine lines: Dab a bit of Touche Éclat directly on wrinkles or laugh lines around the nose and lips, then blend it in with the finger tips. This will visually smooth the recessed areas and make skin look more youthful. 8. Enhance the cheekbones: Use Touche Éclat like a highlighter on top of cheekbones to make them appear more sculpted and brighten the entire face. 9. Make lips appear fuller: Place Touche Éclat around the edge of the lips and blend it inwards to create the illusion of a fuller pout. 10. Enhance your lipstick: After putting on lipstick, apply some Touche Éclat to the outside areas of both your top and bottom lip as well as the cupid’s bow. This will pull focus to a brightly painted mouth. 11. Enhance the cupid’s bow: As an added bonus, you can apply Touche Éclat around the cupid’s bow to sharpen and enhance its lines. 12: Sculpt and highlight your face: Use on the bridge of the nose, between the brows, on the top of cheekbones and on the chin, to sharpen your features. Use in the middle of your forehead, the bridge of your nose, the point of your chin and above your cheekbones. 13. Conceal signs of fatigue: Apply Touche Éclat to the darker areas of your face (underneath your eyes, at the sides of your nose, the corner of the mouth and the hollow of the chin. 14. As a make up corrector: Click Touche Éclat thrice and apply the drop over any smudge. Use the droplet as a corrector and wipe off with a cotton bud. 15. Define the nails: Blend Touche Éclat around the cuticle to shine the spotlight on pretty nails. 16. Elongate the legs: Use Touche Éclat down the side of the leg to elongate. 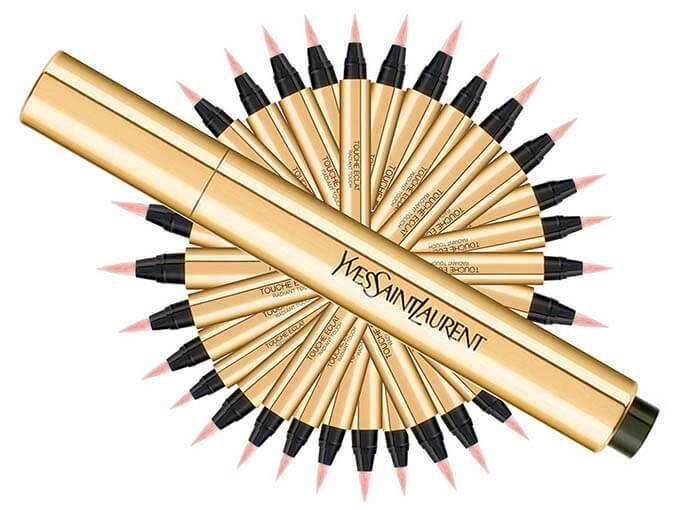 Have you ever used the YSL Touche Éclat? Do you think it lives up to its status as an iconic makeup must-have? « Beauty DIY: The your-hair-never-looked-so-shiny hair mask! I am pretty sure I will not use my YSL on legs. Wonderful suggestions though!